Nicknamed the “Voice of the Wildcats,” Brian was born in Tacoma, Washington and has always been a sports fan who held the men behind the microphones in high esteem. While he played basketball in high school (mainly because of his tall size), it was the men announcing the games who had the greatest influence in his life. He studied the vocal styles of many legendary announcers such as Bob Blackburn (Seattle Supersonics); Bob Robertson (Washington State); and baseball legends Vin Scully and Jack Buck. After graduating from college with a degree in Communications, Brian’s first job in radio was a “rock n’ roll” disc-jockey in Yakima, Washington. He was also responsible as well for News, Sports, and taking out the trash at the end of the day. From there he went to Boise, Idaho for two years until 1979 when a friend told him about a station in Tucson. 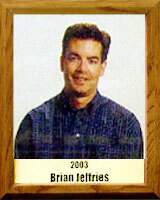 When radio station KGMX (later to become KNST) chose to broadcast University of Arizona Wildcat Sports, it hired Brian as a “dee-jay” who would do sports reports during his show. In 1983 he was selected to do “play-by-play” for UA Baseball and became color-analyst for UA Football and Basketball, working with Veteran commentator Ray Scott. When Scott resigned in 1987, Brian was KNST’s popular choice as his successor and has been the “Voice of the Wildcats” ever since. A dedicated family man, Brian is active with his church and the “Media Fellowship,” a christian-oriented group of local radio and television personalities.